" The Night Club Erashould rate as a Broadway Koran. Other books on the subject are unnecessary if they agree with it, wrong if they differ from it, and in either case should be burned." -- Alva Johnston, from the Introduction Written in the aftermath of Prohibition, Stanley Walker's The Night Club Erais a lively and idiosyncratic account of the people and places that defined New York's night life during the era of "the great American madness." Here we meet murderers and millionaires, gangsters, bartenders, celebrities of the stage, screen, and society, and a host of other colorful characters who populated the city's diverse night clubs, from El Fey to the Cotton Club. Walker relives the "night of incredulous sadness" on which the Volstead Act went into effect, visits a classic speakeasy, discussing the owner's delicate arrangements with policemen, prohibition agents, and bootleggers, and details the frequently brutal swindles practiced in the city's numerous clip joints and the tactics of the era's crime organizations, explaining precisely what happens when one is "taken for a ride." 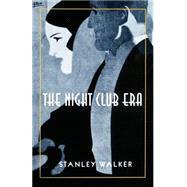 Among the larger-than-life night club habitues Walker sketches are Owney Madden, the elder statesman of the city's rackets; Walter Winchell, America's most influential columnist and the "brash historian of our life and times"; Mayor James J. Walker, who typified the gaudiness, smartness, and insouciance of the city he ran, yet was never too refined to shoot dice on hotel room floors; and Texas Guinan, the beloved entertainer, hostess, and entrepreneur who greeted customers with her trademark phrase "Hello, sucker!" Vividly told, The Night Club Eraoffers a singular, serious -- though never sober -- history of New York City during Prohibition. Stanley Walker was born in Lampasas, Texas, in 1898. After writing for the Austin American-Statesman and the Dallas Morning News, he joined the staff of the New York Herald Tribune as a reporter and rewrite man in 1920. He became night city editor of the Herald Tribune in 1926 and served as city editor from 1928 to 1935. After various jobs with other newspapers and magazines, Walker rejoined the Herald Tribune as editor in 1937. He was appointed editor of the Philadelphia Public Ledger in 1939 and retired from newspaper work a year later. He died in 1962. His books include City Editor (also available in paperback from Johns Hopkins), Mrs. Astor's Horse, Dewey: An American of this Century, and Home to Texas.